Want to add even more leather to your wardrobe? Kenton Michael Design brings you some of the edgiest handmade leather accessories that will toughen up any ensemble. Founded by Kenton Michael Dunn in 2010, this new up-and-coming line specializes in handmade leather and silver jewelry designed for both men and women. 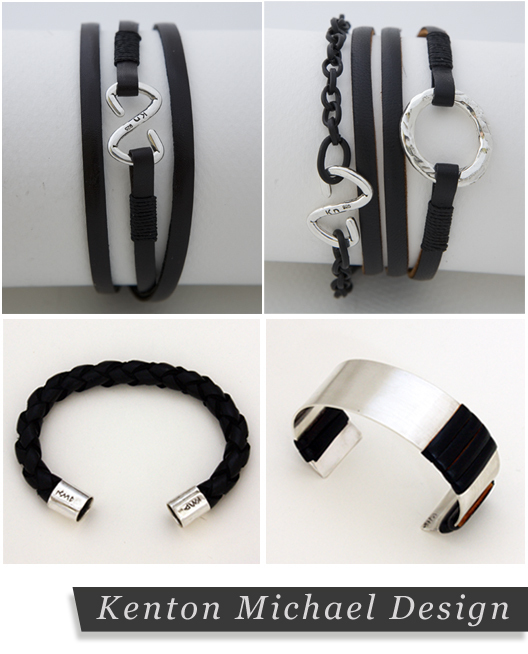 His passion for creating began with art and has developed into this innovative collection of leather and silver bracelets and cuffs. These pieces make a powerful impression especially when mixed & matched and worn together. All designs are available online. The new fall collection will be available at Studio Suzan in Newport Beach tomorrow. I got a sneak peek of some of the new designs today, and from what I saw I can't wait to see the rest of the collection! Think mixed metals and braided leather with an artistic edge. The fall collection will be available online soon! Visit Kenton Michael Design's website to shop the collection and learn more about this amazing line!